Most of us are told early in our flying careers that there are some OLD pilots and some BOLD pilots, but very very few OLD, BOLD, PILOTS. In this group we have about a dozen who are now in their nineties, which satisfies the OLD criterion. Many of that dozen are also veterans of World War II aerial combat, BOLD indeed!. 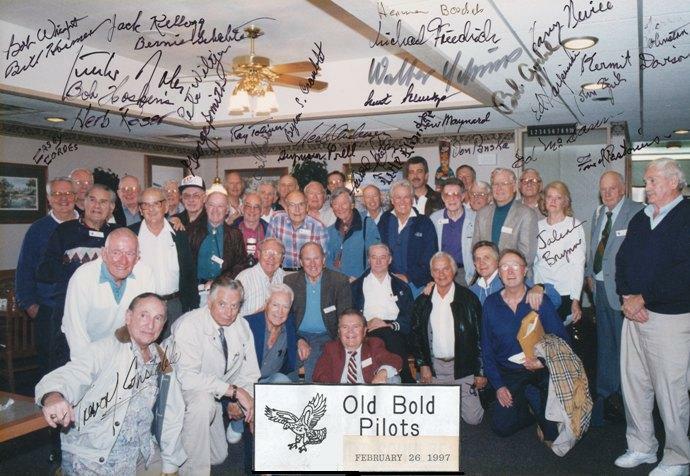 The year was about 1984 or maybe 1985 when Bernie Schechter, Howard Dentz, John Simone and Bob Woodruff, all former US Army Air Force P-47 "Thunderbolt" pilots, started getting together at an Oceanside restaurant for breakfast and to reminisce about their fighter pilot days. They were soon joined by Byron Cramblet and Bill Hosmer. Then in 1995 retired Air Force Colonel Ray Toliver joined the group. 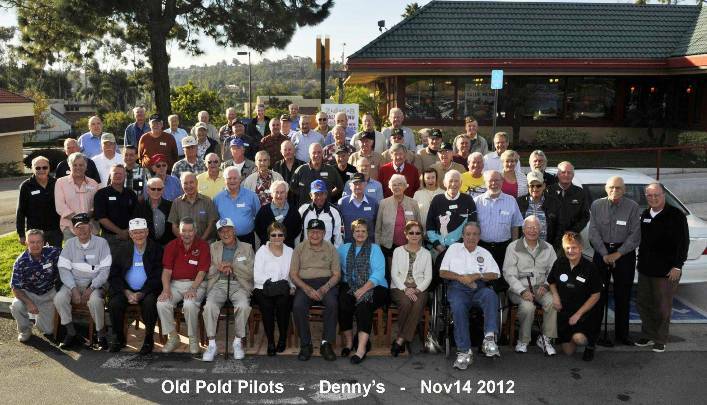 (See 1997 group photo below) It was under his leadership that the group established itself at our present Oceanside Denny's location as OLD BOLD PILOTS. As of this 2011 writing, all of the for-mentioned are now deceased. From the original four fighter pilots, OLD BOLD PILOTS has evolved as it has grown. We now have as many as sixty of more members and guests at our breakfast meetings. Our current membership represents all the branches of United States military service plus civilian and airline pilots, crew members and aviation enthusiasts. Our Denny's restaurant has a separate dining area that they reserve for we OLD BOLD PILOTS every Wednesday morning and they also allow us to permanently display some of our memorabilia there. We do not have guest speakers to provide interest. But attend one of our Wednesday breakfasts and you may find yourself at a table with an Army helicopter pilot with 49 Air Medals to his credit or a B-24 pilot with 50 combat missions, or a pilot who test flew the the worlds largest jet powered aircraft, the Antonov 225 or a B-29 gunner who earned the DFC on a bombing mission to Japan or a Messerschmitt Bf109 pilot with combat missions over Finland, Russia and Norway or a Navy "Seal" Rear Admiral or an Air Force Brigadier General. - - - - - - - - - - - A unique and interesting group. The bottom line: FLYING - It is what defines us - It is our common bond. Of the original 4: 3rd row, Bernie Schechter,3rd from left, Howard Dentz, 6th from left. Ray Toliver is 1st row 3rd from left. Webmasters note: Which name goes with which face has not been fully determined. For those that have, placing the mouse over a face will display the name. If you can help identify others please contact the Webmaster.